Periodontal disease evolves painlessly, producing few apparent signs, even in the late stages of the disease. Then one day, on a visit to the dentist, one might be told that one have chronic gum disease and that may be at augmented risk of losing the teeth. Gums that bleed during and after tooth brushing. Constant bad breath or bad taste in the mouth. Changes in the way teeth fit together on biting, or in the fit of partial dentures. Some people have gum disease only around certain teeth, such as those in the back of the mouth, which they cannot see. Only a periodontist--a dentist who specializes in gum disease--can recognize and determine the progression of gum disease. During a periodontal exam, gums are checked for bleeding, swelling, and firmness. The teeth are checked for movement and sensitivity. Bite is assessed. Full-mouth X-rays can help detect breakdown of bone surrounding the teeth. 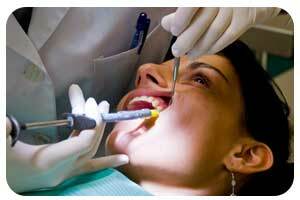 Periodontal probing determines how severe the disease is. A probe (like a tiny ruler) is gently inserted into pockets around teeth. The deeper the pocket, the more severe will be the disease. In healthy gums, the pockets measure less than 3 millimeters and no bone loss appears on X-rays. Gums are tight against the teeth and have pink tips. Pockets that measure 3 millimeters to 5 millimeters indicate signs of disease. Tartar may be progressing below the gumline and some bone loss could be evident. Pockets that are 5 millimeters or deeper indicate a serious condition that usually includes receding gums and a greater degree of bone loss. Following the evaluation, the dentist or periodontist will recommend treatment options. Methods used to treat gum disease vary and are based on the stage of the disease.